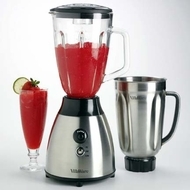 This two-jar blender from VillaWare's Moderno Series is a powerful, stainless steel blender with a glass carafe and a bonus stainless steel carafe for all your blending needs. Pulse button for burst of power at either speed. Includes both glass and stainless steel carafes.